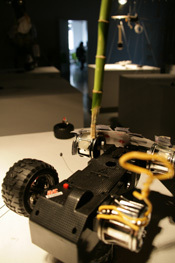 consists of nine individual elements created by the Masters class 2006 from the College of Arts and Communication. 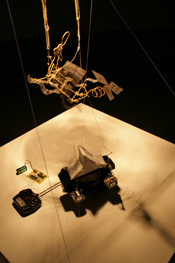 9 remote-controlled kinetic installations, all have something in common; they operate on 27MHz and are all made as variations of the same set of elements: a plant, a piece of fabric, a piece of wire netting, a set of playing cards, two meters of yellow wire, two remote controlled motors with a microchip and light sensor enhanced remote control. These 9 kinetic installations are brought together through the 10th element, a system of spotlights hanging above each installation. 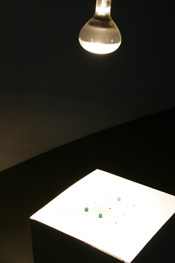 Visitors interact through an interface, a grid of 9 matching holes. Each hole represents one kinetic installation. By covering the holes of the interface the above spotlight activates, and the matching installation spreads out their individual programmed code into the surrounding environment via the common frequency of 27MHz. 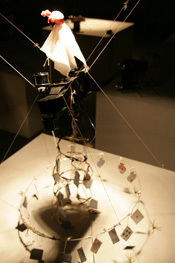 The visitor becomes the conductor and part of the installation. Following a 3 month workshop on Physical Computing, given by Dipl. Ing. Jan Sieber, Bauhaus University Weimar, Germany, the two visiting students Daniel Wessolek and Jonas Halfmeyer, in consultation with Prof. Lothar Spree, guided the postgraduate class of 2006 from the College of Arts and Communication, Tongji University Shanghai, P.R. 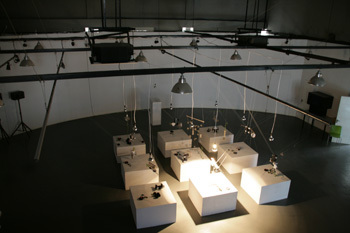 China, to 27MHz: Common Ground, hosted by the Xiao Hui Wang Art Workshop in June 2007. Electronic Zoo (January 2005 at the Shanghai BizArt Center, inaugurated by Prof. Lothar Spree and Dirk Schulz), is the Colleges first exhibition exploring the field of Media Art, it proved to be a great success in promoting the idea of broadening the media's potential, its understanding and evolving an awareness of its ubiquity. The dual master cooperation programme (IIMDS) between Tongji University and Bauhaus University enabled Daniel Wessolek and Jonas Halfmeyer the opportunity of contemplating the development of the Media Art events at the College of Arts and Communication. The cultural differences in education, the notion of art and aesthetics made it a difficult but rewarding experience and required commitment from every single person involved in the project. An intense period looking at contemporary art, presentations, discussions, exercises and the field of electronics within Media Art, 27MHz: Common Ground developed intuitively as a group work over this period. At the centre of this work is receiving as well as sending out information to the surrounding environment. Interpretation and the individual characteristics of each single work, alters the original message and passes it on, modified by a matter of unpredictable circumstances. At first sight the user controls the installation by deciding active and inactive elements. Active elements send out their dedicated signal and reach surrounding elements. How clear the signal arrives, how far it goes and how neighbouring installations react, depends on a number of, for the visitor, unpredictable factors. The visitor controls the spotlights above the 9 elements, triggering the radio signal, which finally activates the immediate element. The installation is receptive, ready to be directed by visitors, it asks them to take part in the creation of a moment through the direct control (of spotlights) and the indirect influence onto the peripheral installations, through passed on, diffused interpretations of the original triggered message. Jonas Halfmeyer & Daniel Wessolek. Liu Ziyi & Zhao Kan; Liu Yan Ping & Li Nan; Yao Xianhua & Huang Chong; Shen Yan, Ke Li & Fan Quirong; Zhang Yi, Wu Xian & Zou Yan; Fang Fan, Zeng Xiaojuan & Chen Yilin; Dang Songming, Lu Mengyuan & Wang Jinzhou; Du Junjun & Chen Hongjun; Xie Mei Chong & Wu Jun; Sun Li, Chen Mengshu, Zhang Yi Qing & Zhao Xiaochuan. Prof. Lothar Spree, Prof. Wang Li, The College of Arts and Communication, Tongji University Shanghai, Mr. Zhang and the Xiao Hui Wang Art Workshop, Dipl. Ing. Jan Sieber and the Bauhaus University Weimar.